This was the last release of "new" studio material from the great David Bowie. Three tracks that did not appear on "Blackstar" and one that did. To be honest, they probably could have been included on "Blackstar" and added to its atmosphere. The EP begins with the atmospheric, haunting, valedictory "Lazarus" from "Blackstar". Most people will be familiar with this wonderful and moving track. It is soulful, saxophone and guitar-driven, with its death-knell solemn drumbeat and its "look up here - I'm in Heaven.." now iconic opening line. "Everybody knows me now..." sings Bowie, plaintively, as the drums continue and the saxophone floats all around. It really is a heartbreaking listen. However, taking it out of context, and viewed objectively it is a damn good track. The end has a rubbery, intoxicating bass line and some cutting, stabbing guitar breaks that enhance it even more. 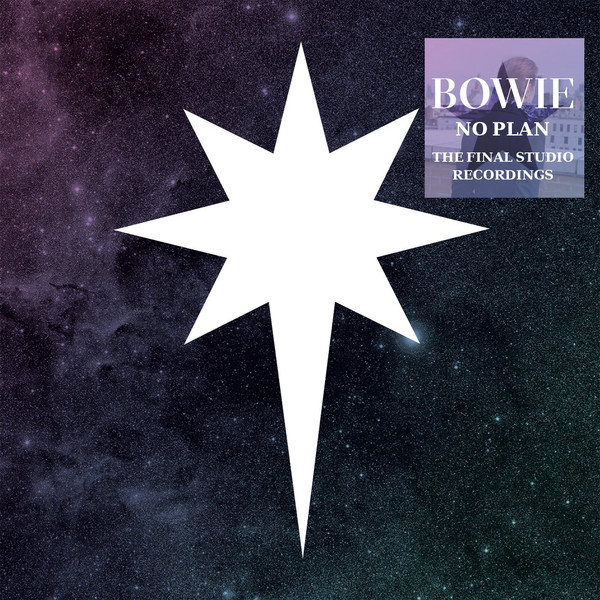 "No Plan" is a sombre, plaintive and sonorous song with that typical, slightly haughty and grandiose Bowie vocal. It is beautiful too. It also has a shuffling drumbeat and that "Heroes"-style deep saxophone sound that is so very evocative. 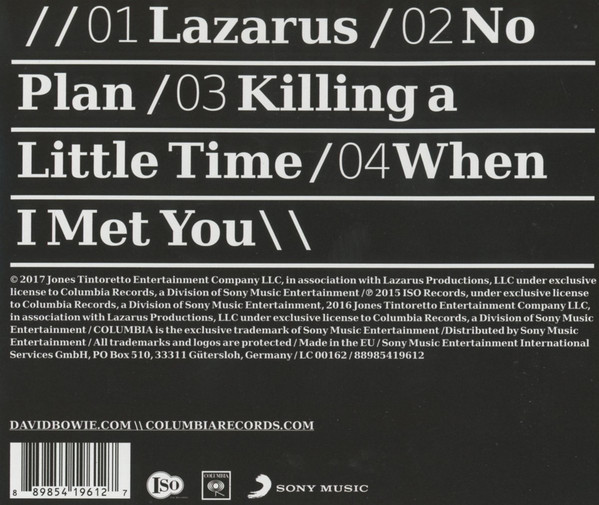 The slightly angry, staccato "Killing A Little Time" is full of dense rhythms and a paranoid-sounding vocal from Bowie. It is full of tense instrumentation. It is a "grower" that needs listening to several times before it gets into your system. 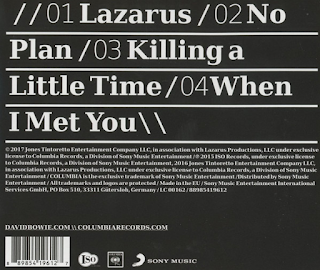 "When I Met You" is a more instantly appealing number that summons up the spirit of "Scary Monsters" and "Lodger", for me, anyway. It also has a feel of some of the material on "The Next Day". I said goodbye to David Bowie at the end of my review of "Blackstar", so no more farewells are needed here. Bowie aficionados need this EP, though, to add to that album and complete the story of this remarkable, life-affirming artist.